Some people collect 17th century French porcelain; I collect farmers markets. Whatever country I visit, whatever state or town, if there's a farmer's market, it's at the top of my must-see list. Even if I'm staying in a hotel room far from home without a fridge, I find something to purchase. Last week in Dallas TX it was ripe heirloom tomatoes that I could snack on out of hand between symposium sessions. In late summer in the US every market seems to offer sunflowers, tomatoes and peppers. While I love those, when I travel I seek products that are characteristic of that area, products that I may not see in my NYC Greenmarket. In Canterbury NH, pop. 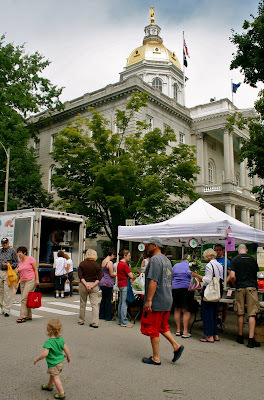 2297, the market is under individual tents in Town Center, between the Town Library and the Town Hall. Here I can replenish my stash of Jill's delectable maple sugar candies. The Saturday market in Concord is sited next to the gold-domed State Capitol. It seems like a perfect statement: New Hampshire supports its farmers. We bought sweet corn for dinner and I reinforced the message of the Worm Lady who was trying to convince skeptics that worm composting was easy to do. In Santa Fe NM the market is in the old railroad yards, complete with quintet playing country & western. I saw both hot and sweet peppers roasting in front of a gas flame, in a cage hand-cranked by the farmer, and hot pepper powder in bags large enough to last a week or two. Back in New York City in my favorite market at Union Square I was searching for true NYC flavor. By 8:15 am when I arrived, the chefs in their white coats, trailing disciples with baskets and hand carts, had already departed with their selections. Then I spied it, the Lower Eastside Ecology Center Compost stand. 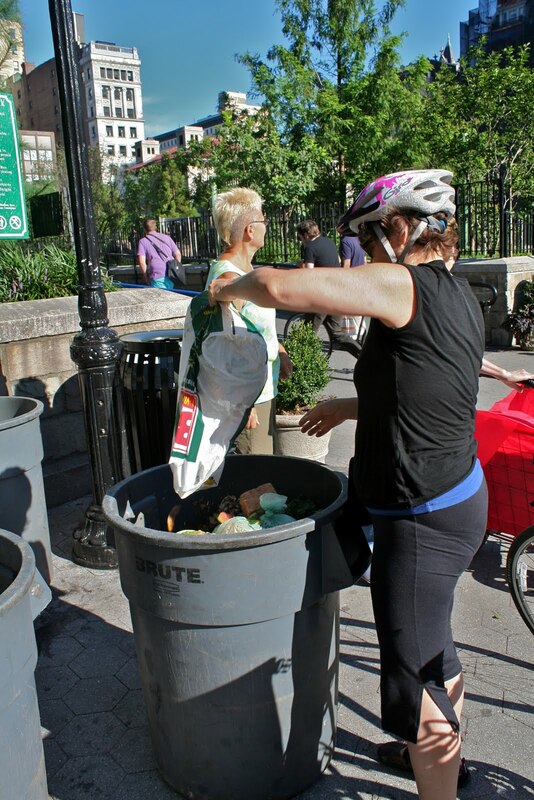 New Yorkers bring their garbage, dump it in containers; the ecology center makes the compost, then bags it for resale at the market. Garbage! It made me proud to be a New Yorker. 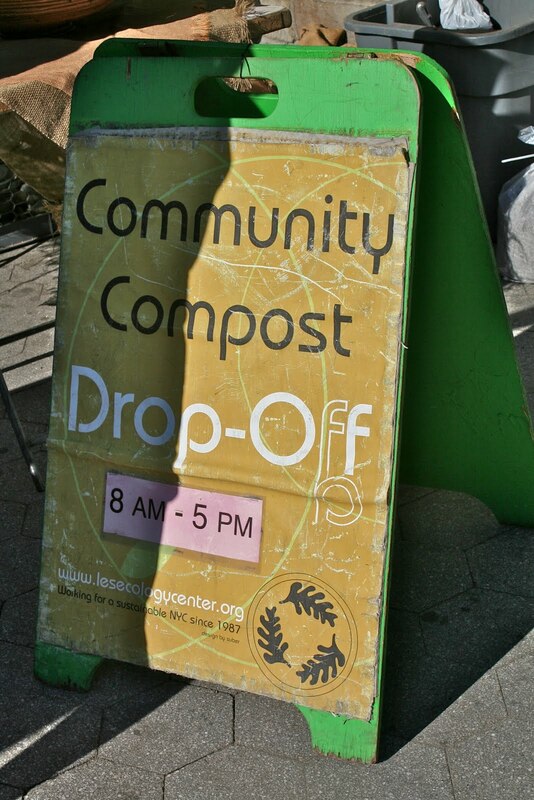 So happy you featured the LES Ecology Center's composting at Union Square! I freeze my veggie scraps and drop them off on Greenmarket days. Their potting mix made the plants on my terrace very happy this year. 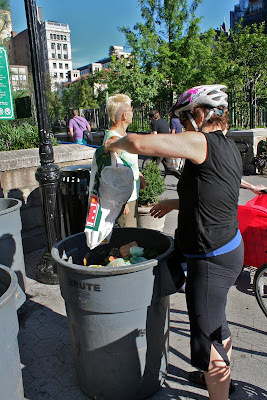 Good morning Joy,I got my red wiggler worms and composting instruction from the Lower East-Side Ecology center and learned an amazing amount from them. My essay about that experience is included in the up-coming book, "The Sustainable Rose Garden"
ESP, thanks for this post! Was feeling guilty about trashing my veggie and fruit ends but now I know about the LES bin. Thank YOU Georgia. See Joy's comment at the top. Many people freeze their garbage all week until they can actually get to the dumping place at the market. Love farmers markets too! When I am in France, I visit them as others would visit museums: not just for the products, but for the beauty and the wonderful scenes that unfold, as you have captured here. I want one of those pepper roasting cages! Thank you for such a wonderful post. It was great to learn about the various places made so unique with their own Farmers Markets. I too LOVE visiting greenmarkets to better see what is special about an area. So exciting to experience... My favorite? My own Greenmarket in Union Square, NYC! Every visit is different and interesting -- and delicious. Thank you again for such great reporting. market. I keep hearing what a wonderful farmers market Portsmouth, NH has, plus I am curious about the Boston one near South Station"